Violets and butterflies in a wicker basket make a beautiful gift. It's perfect for so many occasions. The african violet plants are placed in a ribbon-wrapped handled basket. Butterflies complete a delightful gift. 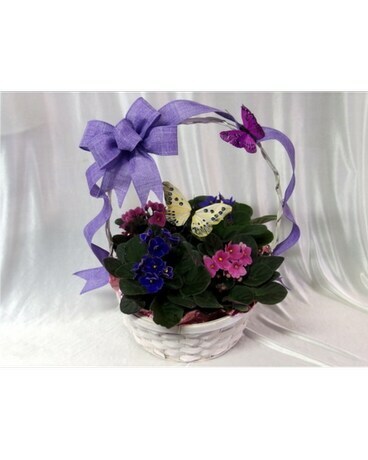 Violets and butterflies in a wicker basket make a beautiful gift. It's perfect for so many occasions. The african violet plants are placed in a ribbon-wrapped handled basket. Butterflies complete a delightful gift. Each basket is individually made in our greenhouse. The basket and colors will vary.